« Is cancer hereditary? Cancer risk awareness and the “Angelina effect”. Great post Ruth! What did you present at that ’91 meeting? 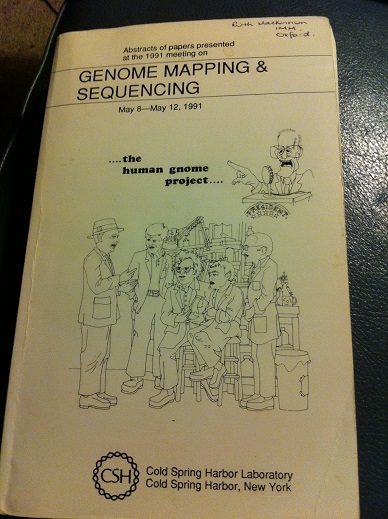 I love the whimsy of printing the entire genome in a series of books. 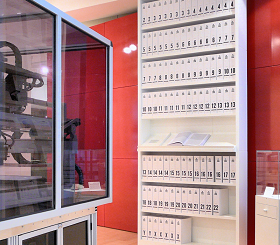 So mind-boggling to think that all that information is printed several trillion times over in each human body. Yes, mind-boggling indeed, and to think of the speed at which it’s happening. In 1991 I was doing my postdoc in Kaye Davies’ lab at Oxford hunting down the fragile X gene. I presented work on a clone from a microdissection library from the fragile X region, from Uwe Claussen and Bernhard Horstemke, pioneers of microdissection. The clone turned out to be in the nearby L1CAM gene but was very interesting. I also co-authored Andre Rosenthal’s poster – he used the clone as a starting point for his PCR walking technique. At the Cold Spring Harbor meeting Agi Gedeon from Grant Sutherland’s lab (where I did my PhD) announced that they’d cloned (beaten us to) the fragile X gene. The back of the abstract book is even better – more gnomes – it doesn’t scan well because it’s drawn with very fine lines but I’ll try and get it into my next post. Ouch. Being beaten to the punch can’t feel good!